When this card is Normal Summoned: You can add 1 “Trickstar” card from your Deck to your hand. Each time your opponent activates a Spell/Trap Card, inflict 200 damage to them immediately after it resolves. Trickstar Candina starts off the Trickstar week on Pojo. Searcher for the archetype, good stats and support behind her. Any Trickstar card can be searched, so if you don’t get Light Stage or a Terraforming in your opening hand, you are still good. Get the Trickstar you need to pull off a good opening move or a counter move to your opponents turn. The burn damage she can do is underrated and gets overshadowed because she usually isn’t the one burning the other player. If your opponent plays a lot of spell/traps that don’t deal with Candina, the damage can add up, especially with Light Stage and Lycoris if the cards they play add to their hand or draw. Happy Monday! Trickstar Candina starts Trickstar week because she is a very Monday card. By that I mean she is absolutely necessary and taken for granted. First, she is a Level 4 Light Fairy-type monster with 1800 Atk and 400 Def. Second, she is the opening Normal Summon you want so you can have 1800 Atk on board and a free search from the deck of any Trickstar card. Third she does her own burn 200 damage after resolution of any Spell or Trap the opponent resolves. In the Trickstar deck she is overshadowed by other cards that do more compounding damage on their own and don’t rely on the opponent as much. Her search effect is good, but commonplace at this point. Her stats are good, but they are the same as everyone else. My point is, Monday over here is cute and awesome and is deserving of her time in the spotlight. Trickstar Candina, take a bow. We are looking at Trickstar cards for the first time ever on the site this week somehow and I hope this means we look at Gouki, Altergeist, and Rokkets sometime soon after this, preferably the first two. 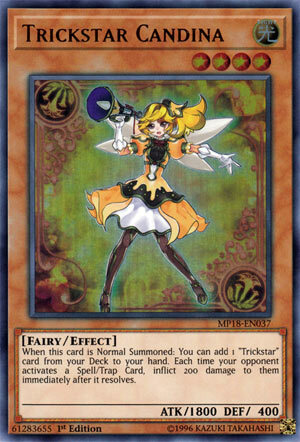 With that out of the way, we start with the best Normal Summon in the deck, Trickstar Candina. Trickstar Candina is a Level 4 LIGHT Fairy with 1800 ATK and 400 DEF. ATK is great, DEF is poor, attribute and type are good. When this card is Normal Summoned, you can add 1 Trickstar card from your deck to your hand. Lilybell will Special Summon herself from the hand upon being added to it from anywhere, Candina can bounce a Trickstar monster to Special Summon herself from the hand (which can trigger the aforementioned Lilybell), Light Stage is the best Field Spell in the deck, and Reincarnation is an amazing trap, and if we ever get Calobane that’ll be a good monster to Special Summon for free plus to have a potential “Honest” like monster. The card searches the whole archetype, and it’s full of great cards. Each time your opponent activates a Spell/Trap card, inflict 200 damage to them after it resolves. Oh boy, burn! I personally don’t like Trickstars, mostly because of the burn and Reincarnation banishing your whole hand as well as Light Stage locking down backrow, it just personally isn’t fun to play against. With that said, I cannot deny the power of the deck and Candina adds to that by being a searcher for everything part of the archetype. Play 3 if you are playing Trickstars in any way. Art: 4.5/5 I’d be lying if I said these girls weren’t cute. The Trickstar theme can be an incredibly cute set of people, no? Trickstar Candina is a Level 4 Fairy Monster, with 1800 attack (and 400 defense) and ignoring the low defense, we are happy with things like Light and 1800 on a Level 4. Light (in addition to being Fairy for synergy) also gives this Honest companionship, which we also appreciate. A Normal Summon of Candina allows you to net a new card of the Trickstar family from your Deck to your Hand. Any card in the theme to your Hand from the Deck just for a Normal Summon, let alone one who holds her own with her attack? Yes, please, we’ll gladly take that. The burn effect attached is negligible, at best, but it’s still something else. 200 Damage, even as a repetitive effect, isn’t going to do very much. It might be something more if it were every time either player activated a Magic or Trap card (and note, that the Damage is after resolution) which shouldn’t be a huge deal either, and again, it’s still something else going for Candina. She’s very solid support and an attacker for a difficult Deck to play against. Art: 4.5/5 Love the color scheme, nice and bright, possibly deceptive, and very cute as mentioned at the open.